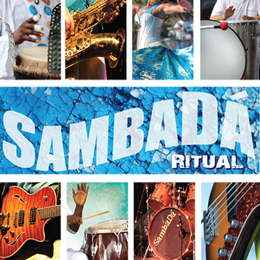 The title of popular Santa Cruz-based Afro-Brazilian band SambaDá’s new album, Ritual, is a nod to their feelings about making music together, but the group’s mealtime ritual perhaps speaks even more to the bandmates’ family dynamic. “We all share plates, switch plates,” says lead singer, dancer and percussionist Dandha da Hora over tea on a sunny Tuesday afternoon at a band meeting in the Westside home she shares with SambaDá multi-instrumentalist Anne Stafford. “Someone steals straight up from everybody else’s plates,” adds Stafford. “I guard my plate,” says percussionist Will Bates-Minou, to laughter from the rest of the group. This spirit of constant sharing and trading off also defines SambaDá’s music and performance style. Percussion is the soul of SambaDá. “We’ve all spent time studying it, and that’s a good way to understand Brazilian music, through percussion,” Stafford says. So when all three of their central percussionists had children around the same time a couple of years ago, leaving the band to focus on their new families, SambaDá—together for 16 years now—faced a period of uncertainty. Looking to fill the void, Stafford thought of local master Senegalese percussionist Ibou N’gom of Domu Africa. “Even though he never played Brazilian music before, our roots are in Africa, so we’re not that far apart culturally,” she says. The band members were delighted when N’gom got on board, along with bassist Etienne Franc and, a year later, the newest member: percussionist Will Bates-Minou, who rotates with founding band member percussionist Gary Kehoe. With a new lineup established, it was time to get to work on Ritual, their third album, out this month. The newly released CD—featuring 11 tracks composed primarily by Godinho and arranged by Godinho, da Hora, and Marcio Peeter—was recorded in a single room, in an attempt to replicate the band’s live energy. Special guests bring instruments not heard on previous SambaDá albums: Tammy L. Hall on piano and keyboard, Alan Williams on trombone, and Jon Cavanaugh on trumpet. Brazilian percussionists Peeter, Wagner Profeta, and Abel Damasceno also joined in. Will Khan and Richard Williams of Santa Cruz-based BURL engineered and mixed the colorful album, with artwork evocative of Brazil’s sand, sea, and musical instruments by designer Melanie Wylie. 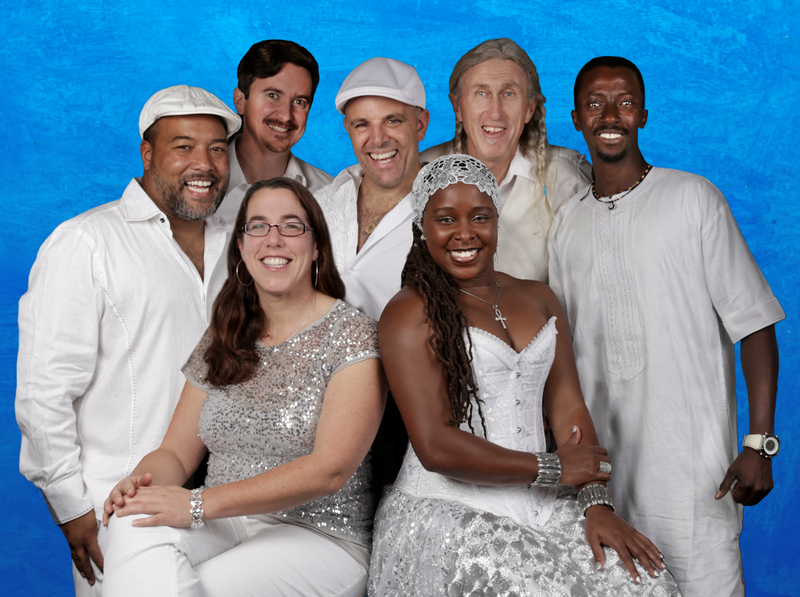 Ritual’s energetic songs including “Jamais Esquecerei,” which Godinho wrote about falling in love with his fiancée (Profeta and da Hora arranged the Samba Afro in the song), and “Na Ladeira,” inspired by the Afro-Brazilian martial art capoeira, of which Godinho is a mestre avançado, “advanced mestre,” a title recently bestowed upon him by his own mestre at Godinho’s annual capoeira batizado—graduation ceremony—earlier this month. This made Godinho one of three to achieve this rank in the international capoeira academy Raizes do Brasil. (Godinho’s capoeira students provide backing vocals in the chorus.) The Cumbio track “Perdido” and the humorous “White Toyota,” the band’s first track in English co-written by Godinho and Kehoe, round out the danceable, eclectic, and romantic collection. “With age comes wisdom,” Stafford adds. As long as they don’t steal too much food off each other’s plates, this family of a band’s future looks as bright as its roots are deep.